Tell us about your area of Sneinton... and find out how to gain control over what happens there in the future. 18th June. The planning system is changing, and there has never been a better time to get involved to ensure local voices are heard. 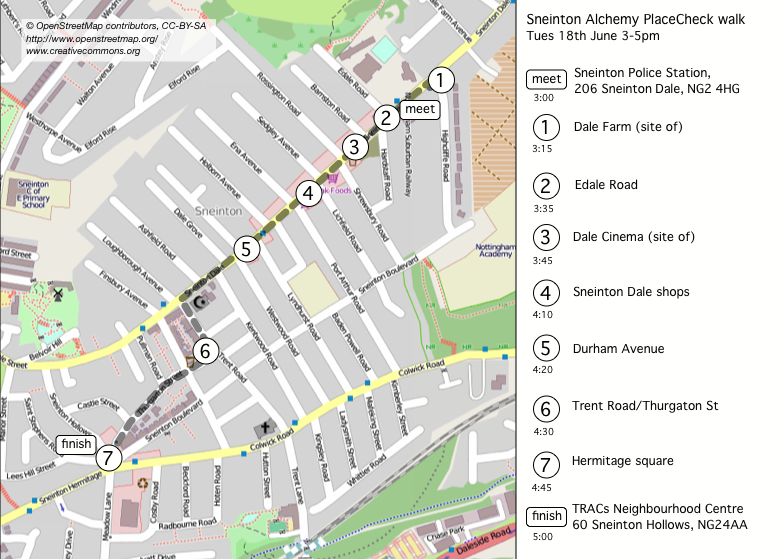 We are hosting a walkabout in Sneinton to view and discuss places of interest such as the empty Dale Farm plot, the old Aerborn Factory site, the empty Burrows Court tower, the site of the proposed Mosque and community centre on Sneinton Dale, the Windmill car park and Hermitage Square... these "Placecheck" walks are a great starting point for looking, understanding, talking and thinking about local places with local people. The walk last about 2 hours with stops. Bring comfortable footwear, a camera and your opinions to share. The walk will finish at TRACs neighbourhood centre, where there will be refreshments before the evening talk. One outcome of the Placecheck exercise might be that one or more Neighbourhood Plans gets off the ground in Sneinton. Local communities are now able to produce Neighbourhood Plans for their area, putting in place a vision and policies for future development (instead of just objecting or supporting what has been proposed by others). To explain what's involved, what help is available and how to get started, we will be hosting a Neighbourhood Planning talk to follow the Placecheck Walkabout. Entry to the talk will be free, but please email tom@sneinton-alchemy.com to ensure you get in, as space is limited. We look forward to seeing you on June 18th; In the meantime you may be interested to read about the Sneinton Vision project which established a shared local vision for the whole of the area.